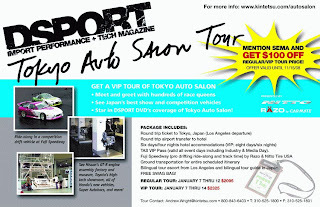 The D Sport Magazine 2009 Tokyo Auto Salon trip is coming up soon. January 7-12 for the normal tour. January 7 -14. The tour includes a tour of the factory where the R35 GT-R engine is built. Click the link for more information and pricing.